Before I begin to discuss the spectacular success of Amy and two other incredible swimmers, I feel I have some explaining to do. I am not a coach. I am not a professional journalist. I’m not even an adult. I’m just an Age Group Swimmer, and I write nearly entirely based off of my previous experiences. The point of these articles is to provide background on some really fast swimmers that could be the future of USA swimming, answer questions about them you may not think to ask, and delve in to the similarities and differences in each of their stories. That last part you may have to wait for, sorry. Now, allow me to begin. Amy Bilquist is a person, along with an insanely fast swimmer, if that’s possible. She’s really tall, afraid of plane rides, and has big dreams, at least that’s what I noticed on March 14th, when I interviewed her right after my practice ended. Amy will be attending Cal-Berkeley next year, because it “exhales excellence” and “is something she wants to be a part of”, and she has already been on the World Championships team representing the United States. As a member of Carmel Swim Club, she knows greatness. The girls team is arguably not only the best team in the country right now, but the best girls team EVER. This year they won their 29th consecutive high school state championship. I expect an ESPN 30 for 30 next year, if they win again. Training with that kind of reputation is extremely tough, especially when you move in to it when you’re already almost a junior, as Amy did. She moved to Carmel from Goodyear, Arizona. She says, “Honestly, I was a little intimidated at first. Everything just seemed to flow so well, and I wasn’t used to that, so it took a little adjusting to.” The transition to Indiana “taught her a lot about who she was, and what she wanted to be.” Pretty deep stuff, especially for not even having graduated a high school yet. I almost let my inner swimming nerd carry me away there, and I was tempted to ask her about technique, work ethic, the type of training she did, and other assorted swim questions. Then I remembered, hey, what would an age group swimmer be interested in? The hardest practice Amy has ever done was 10x800s on “some insane interval”, odds IM, evens Free. She was “crying at the wall” by the time it was over, and my body hurt just listening to her talk about it. Her favorite race memory was from when she was 14, just after Olympic trials, at Speedo Sectionals, the 200 Back. She went 2:14, long course. It was at this point that I realized one glaringly obvious thing. Her long course time was faster than my short course time is. Maybe I need to work on backstroke a bit. When Amy was eleven, she trained with the Senior group on her team in Arizona, because you know, why not? The more questions I asked, the more ridiculously amazing some of the things Amy has done seemed. She’s an American Record holder in the 4×50 Free relay, and she “definitely did not expect it”. She got the record at World Championships last year, in Doha, Qatar. The scariest thing about that trip, for her, was the plane ride. Not the Olympians at the meet, or the foreign country, the plane ride. Amy Bilquist is without a doubt a phenomenal swimmer, and a hard worker. She didn’t swim at Charlotte this year though, and you know why? Her foot’s in a boot. She has multiple stress fractures. The strange part is this. I can tell you that if I had multiple stress fractures, I would not be training, but Amy is. I am almost positive I have seen her on the pool deck every day. Bilquist is a force to be reckoned with, not only because of talent, but because of dedication. Miss Bilquist is definitely one of the most promising young American swimmers for the next years. 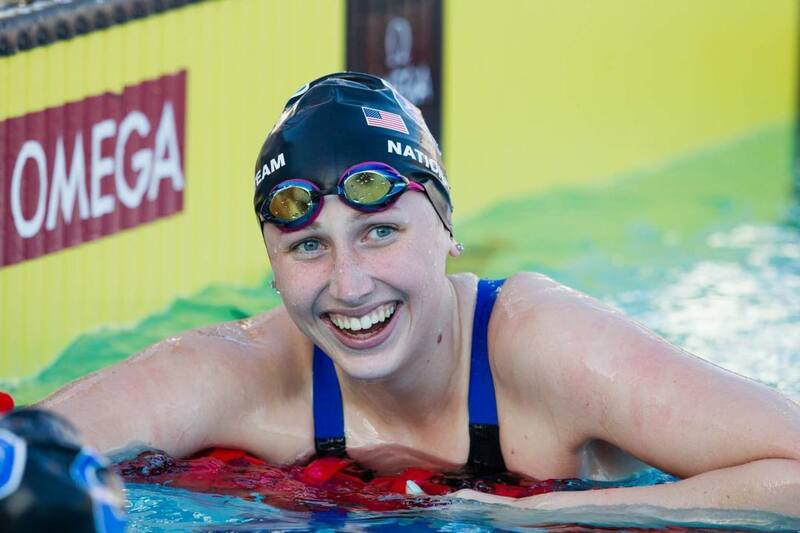 And I’m very proud to have picked her in my early 2016 US olympic team predictions in the 100 back with Missy Franklin. I was really surprised that a middle schooler wrote this story! Very impressive! Just a small corrections for the future: shouldn’t the first sentence read “Amy Bilquist is a person, [as well as] an insanely fast swimmer, if that’s possible.” ?